Today is Jacob’s 5th birthday. I am not at his party. Boo. But there are SO many kids there and my tendency to love up on the children it’s best that I am still in quarantine. Although, yesterday I did bust out for the day. I went to Sara’s and caught a ride with her down to my Mom’s house. Jake & Joey were in the car with us. Papa babysat the boys while us girls went out for lunch and a movie to celebrate Morgan’s 18th bday. I can’t tell you how hard it was to be around my family and not give out hugs and kisses. We’re a huggy kissy family! But I kept to myself. On the way down I let Jake open up his presents from Uncle Jon & me. We gave him this cool led light up football It turns all sorts of colors. V.v. cool. We also got him a new pair of Crocs Bayas . He LOVES them. We got him a pair of Caymans last year and he has literally worn the tread completely smooth on the bottom. They are such great kids shoes. 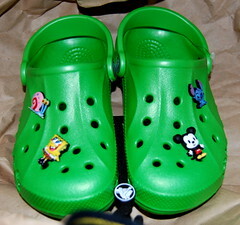 I got Joey a new little Jibbitz for his Crocs too. So we dropped the kids off and piled into Morgan’s car and headed for lunch. But we didn’t think to check business hours so our intended lunch destination didn’t work out. We ended up having burritos at Moe’s. I can’t believe it but I didn’t take a single picture all day. So you can’t see the delight on Momo’s face as she opened her present. We went big this year as it’s her 18th/Graduation present. We thought we could buy 2 small presents or 1 big so we went big. She was thrilled. We got her a new digital camera. I also found this super cute skin for the camera, and a wristlet on ebay as a carrying case. So she’s all set. After lunch we walked over to the movie theatre and saw 21. It was cute. I’m amazed at their mental abilities. I can’t stay focused long enough to count enough cards in a suit much less a bunch of decks!